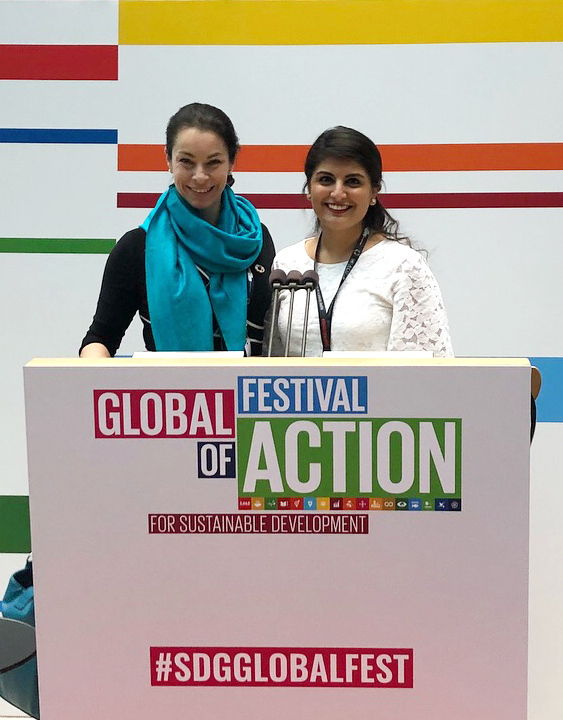 In March 2018, Heather McPherson and I represented the ACGC at the Global Festival of Action for Sustainable Development in Bonn, Germany. ACGC was one of 38 finalists for the United Nations SDG Action Awards for our Together 2017 Symposium held in Calgary, Alberta in October 2017. It was a privilege to be amongst some of the greatest innovative minds, community mobilizers and SDG advocates from across the Globe. The Festival was buzzing with interesting conversations, exciting projects and SDG enthusiasts like myself who were ready to dive in and make the most of the three days. The days were packed with interactive sessions that focused on how to put the SDGs into action through innovation, citizen engagement, communication, mobilization and multi-stakeholder engagement. We shared and learned from one another about the specific actions we are taking to achieve Agenda 2030 in our respective home countries. One of my favourite interactive sessions was World’s largest lesson activation, which enabled conference attendees to take our lessons learned and apply them in the local Bonn community by teaching young citizens about the Global Goals. Another favourite was Youth-led accountability for the SDGs: Education, empowerment and engagement, which provided space for youth advocates who have led grassroots SDG campaigns an opportunity to share best practices in mobilizing and collaborating towards the SDGs. Lastly, Leaving no one behind: Identifying data needs and gaps to support humanitarian and development response explored the intersection of data, humanitarian development and how the information collected can be effectively used to develop better and more comprehensive programming. My experience at the festival was shaped by many thought-provoking conversations, engaging sessions and passionate discussions that opened my mind to new ways of mobilizing and partnering with those who are investing their time and energy to ensure we achieve Agenda 2030. I took a number of key takeaways from the Festival for achieving the UN Sustainable Development Goals, including the importance of being more creative in the way we collaborate. More specifically, we must be open to multi-stakeholder partnerships and the kind of innovative and intersectional processes this requires. Secondly, human connection drives the work we do, thus we must ensure that we leave no one behind, especially under-represented groups such as Indigenous and marginalized communities. 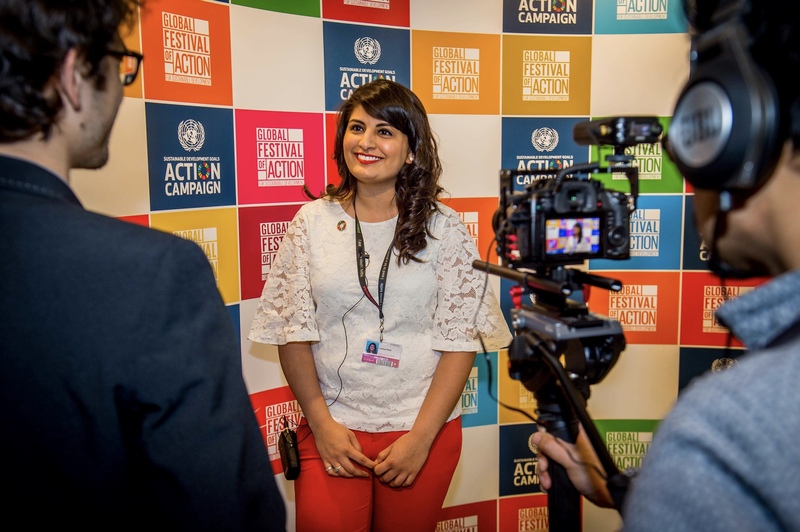 Youth across the world are doing really amazing work to drive change and advance the SDGs. It is important to support this momentum. Lastly and perhaps most importantly, I was reminded that amongst the chaos of this world, there is hope. There are people who are mobilizing across the globe, who are fighting the inequalities, who have dedicated their lives to building communities in the spirit of sustainable development. We are so grateful for the Global Festival of Action’s acknowledgement of the Together 2017 Symposium and for providing the opportunity to learn, share and connect with SDG advocates from around the world. We are excited to channel the momentum towards advancing the 2030 Agenda as we convene this fall in Edmonton, Alberta for Together 2018.